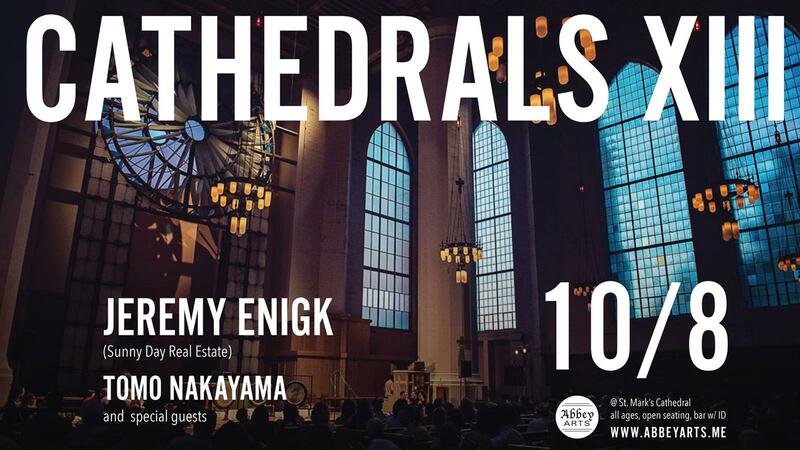 CATHEDRALS XIII is part of a concert series presenting local & touring indie bands in epic spaces like St Mark's Cathedral. Enigmatic Seattle legend Jeremy Enigk rose to fame in the mid-90s as frontman of the seminal emo band Sunny Day Real Estate. His solo career debut "Return of the Frog Queen" has since become a cult classic * Laura Gibson is an American folk singer and songwriter. Her latest album Empire Builder was released April 1st, 2016 on Barsuk Records / City Slang. Gibson's songs have been described as "haunting portraits of nostalgia and intimacy, of loneliness and wide-eyed hope". * Tomo Nakayama's work both as a solo artist and with his chamber pop band Grand Hallway have been praised by NPR and New York Times. He's been praised for his crystalline high-tenor voice, intricate fingerpicking, cinematic production style, and simple, poetic lyrics influenced by the images of the Pacific Northwest.